The powerful tractor CLAAS XERION 2000 was first introduced to the public. XERION as its own development CLAAS combines the requirements for a modern tractor with the requirements for a system agricultural vehicle. The cab is installed in three different positions, providing different applications: first, as a classic tractor with a central position of the cab, and secondly as a system vehicle with a 180 ° rotatable driver's cabin with a middle and rear position in the middle and, thirdly , As a vehicle that has a cab above the engine and is therefore convenient for transporting semi-trailers. The adapters offered for XERION further extend the scope of application. Another feature of the XERION is the award-winning and continuously developed HM-8 gearbox developed by CLAAS specialists. With the purchase of a controlling stake in Renault Agriculture, CLAAS complements the range of products produced by standard tractors. In the same year, from the former Renault tractor plant in Le Mans, France, the first green-painted CLAAS tractors, first presented to the public at the Agritechnica exhibition, are descending. The four models include a line of tractors in the traditional CLAAS salad color: the universal model CELTIS, the top class ARES tractor, the large ATLES tractor, and the Harzwinkel "royal" class XERION. The new large XERION 3300 tractor is entering the market. The revised CLAAS XERION 3300 is a universal tractor in three versions. The XERION TRAC version with 335 hp, the stepless ZF Eccom 3.5 gearbox, the RABA-controlled axles and the electronic all-wheel drive system with six control programs. Version of the XERION TRAC VC, which is distinguished primarily by the turntable. And the version of the XERION SADDLE TRAC, the cabin of which is rigidly mounted on the front axles. Offered in five different versions from 163 to 260 hp. CLAAS AXION is the first tractor from the former Renault tractor plant in Le Mans, which from start to finish is the creation of CLAAS. Its development began in late 2003, shortly after the CLAAS family was enlarged with tractors. The first place in the design of the new AXION was a high level of comfort, improved handling comfort, as well as high power combined with economical fuel consumption and high reliability. Installed on the CLAAS AXION, the 6.8 liter 6.8 liter DPS engine not only meets the TIER 3a exhaust emissions standards, but also thanks to modern technology it provides less fuel consumption than the TIER 2 standard. As a result, CLAAS has got another modern tractor for large Agricultural enterprises, contractors and machine parks. In the tractors segment, CLAAS presented the new ARION 500 and 600 series at Agritechnica. Due to a wide range of power tractor from 112 to 155 hp. CLAAS has managed to reach a significant part of the international clientele. CLAAS POWER MANAGEMENT in large models ARION 540 and ARION 640 allows you to release an additional 20 horsepower for the most difficult tasks. The new ARION series is equipped with a convenient HEXASHIFT transmission, which automates the group change and is switched without the aid of a clutch. All ARION tractors develop a final speed of 40 km / h or 50 km / h (optional) at an economical 1900 rpm. CLAAS AXION with infinitely variable transmission CMATIC. The AXION is offered in five different versions from 163 to 225 hp. (From 120 to 165 kW ECE R24) and fills a niche between ARES 600 and ATLES. The main components of this modern tractor were developed from scratch. This is the first tractor, which from the beginning to the end is the creation of CLAAS. Its development began in late 2003, shortly after the CLAAS family was enlarged with tractors. A powerful XERION 3800 tractor is presented. The 378 horsepower XERION tractor equipped with the new CLAAS SEQUENCE MANAGEMENT, steering system for GPS coordinates and the ISOBUS connector, turns into a true universal talent. Thanks to the already proven TRAC VC rotary cab, the driver retains the familiar perfect circular view. CLAAS presents the compact ARION 400 tractor. Six new engines of this new compact class cover the power range from 90 hp / 66 kW to 125 hp / 92 kW (according to ECE R24). Features and dimensions allow the ARION 400 to purposefully fill a niche between the ARION 500 and the AXOS. At the Agritechnica in 2009, CLAAS first introduced two new XERION 5000 and 4500. Along with the XERION 3800 and 3300 models in the class up to 400 hp. With these two models, CLAAS extends the range of tractors up to 500 hp. and higher. In the pavilion 6 at the SIMA exhibition at the CLAAS booth the preliminary premiere of the new AXION 900 tractor is noted. Four models with a 280-400 hp capacity. Complemented the already well-known series AXION 800 with 164-260 hp. And the XERION 3300-5000 with 330-530 hp. The AXION 900 is the first model of the CLAAS tractor, which complies with the TIER 4 exhaust emission standards. The CLAAS POWER SYSTEMS (CPS) technology is first used in the AXION 900. CPS represents the optimal combination of innovative components and technologies in the drive. 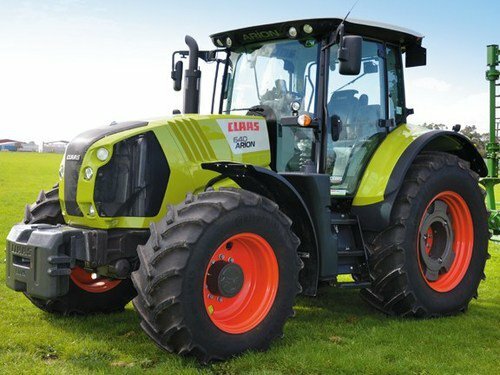 With the release of the ARION 500/600 series, CLAAS can offer customers the technology and comfort of powerful tractors also in the power range of 140-184 hp. The 4-cylinder models of the ARION 500 series feature versatility and potential power, especially when working with a power take-off shaft and a front loader. The 6-cylinder models of the ARION 600 series are convincing with high tractive effort and smooth running on the field and during transportation works on the roads. The new CLAAS AXION 800 is presented. 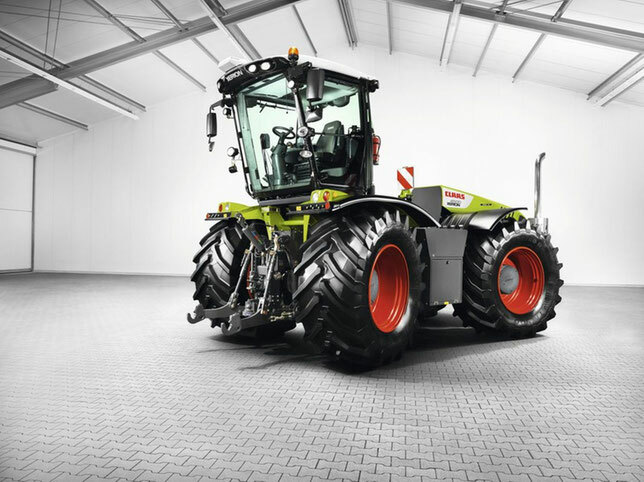 This is a completely new development in the CLAAS family of tractors, equipped with engines from 200 to 270 horsepower. It is also the first series produced at the Le Mans plant, the engine of which complies with the Stage IV (Tier 4f) standard, and thus already meets all future requirements for gas toxicity. Successful basic concepts, embodied in the first 800 series, CLAAS remained true to the design of the new AXION 800: a compact design with a long wheelbase, as well as various components and control systems CIS and CEBIS. At the first stage the tractor is equipped with a HEXASHIFT gearbox, a bit later the CMATIC continuously variable transmission will be added to it.